I have been a little pre occupied of late. Some things have been going on the my hubs new job and we weren't sure all the paper work was in order. He has been sitting waiting for the the phone to ring for him to go to work but it never rang. After waiting and waiting finally a call went through to the HR dept only to find out that he was not on the call in list. Are you kidding me? He went through a long drawn out process just to get the job and these people are not very reliable as far as their word. They say the will call but you wait a long time. Anyways after finding out he was not even on the list, the HR person said she would look after it and then call him back. Well a week and half later no call. Hubs by now is ready to blow his top and then some and he calls to find out she is on vacation for 2 weeks. Are you kidding me. When someone says they are going to call you back would you not think before you were to go on holiday you would tie up loose ends? Apparently not. Even if you are just a call in for now and need to get some hours in for future full time job prospects you would think they could at least straighten something out and let the guy be assured he is on the list. Well he finally got fed up and went to the actual office where his supervisor works which is a different location then the HR person was in and spoke to the main man. Apparently there was an email, things are straightened out and hubs is on the list. My goodness, sleepless nights, worry, anxiety, and no stop talk of this has been going on and I am trying to keep the anxiety level down and on even keel. Phew am I glad now that tempers are not flaring and the nervous system has calmed down. Anyways a bit of how life has been on the edge for us but come September things are going to pick up. I made these 2 canvases in the last week. They were works in progress. I found a tutorial on the web but I can't for the life of me remember what blog it was so I am sorry I cannot give credit to the person who posted this. If you are reading this please let me know so I can give credit where credit is due. I cut a canvas board in half which was originally 6x8. 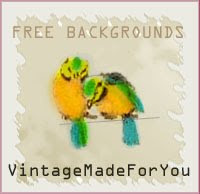 I didn't want too large a background for the smaller images I was using. I used an Artchix image I had in my stash of a woman sitting at her sewing machine. I placed gauze on my canvas with gel medium. Let that dry then applied some lace all around the edges. Not so much in the middle as it was going to be covered. Let that dry and with the humidity it took longer than I had patience especially this week. After it was all dry I applied Burnt Umber, black and Copper acrylic paint to the surface making sure I got all the materials and lace covered. Again dry. Then I went to town and embellished. I took a piece of chipboard because I didn't have an old book cover and painted it a tan colour, then scribbled wax on the edges and then painted black over that then sanded the black off to reveal a scruffy cover. Works for me. 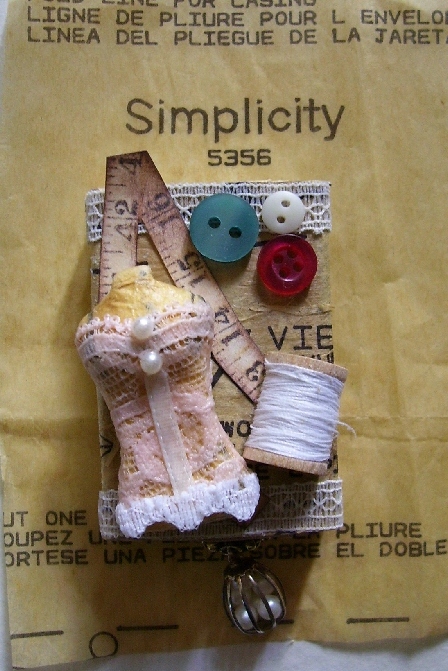 I added a bit of a piece of a sewers measuring tape (was actually a scan of my mother's, I remember when she taught me to sew I used it and I have fond memories of it) half a spool, some buttons, lace etc . This turned out better than I imagined. I think I will be giving this to a friend of mine who loves to sew. 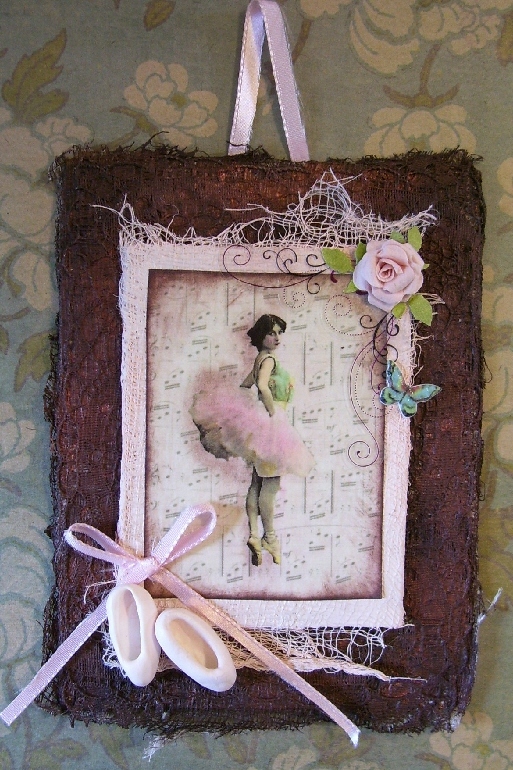 The next one is similar but for a Bella Creations Challenge for the Oh La La group. 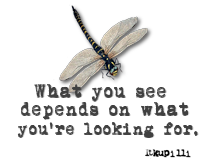 The image was provided to us by Gecko Gals and we were to use it to create anything we wanted. So naturally after going the first canvas I thought why not do a ballerina one. I even made the little slippers out of air dry clay and painted them a very light pink colour. I have been playing with the Gimp program so I made my own background, removed the original background for the ballerina, I used a free gimp music brush. I then inked the edges with some java ink. Assembled and this one is going to another friend who loves ballerina's and dancers. And last but not least is a matchbox for the FlickR monthly matchbox swap and my partner is Smiff or aka Jan. The theme for this month was my favourite things, so we were to make a theme that our partners liked. So I know Jan likes vintage and sewing etc so I made this little sewing themed box just for her in mind. I even made the dress form out of air dry clay, covered with sewing tissue then glued on pink lace, ribbon and some pearly buttons. I really enjoyed making this and the drawer pull was an earring but I took it apart and attached it to the box. I also filled it and a small baggie of stuff for Smiff. I couldn't fit it all in that tiny matchbox and Jan spoils me every time we trade so time to give back some art love. ﻿Well that is enough rambling for one post. Thanks for hearing me out. I am just waiting for some things to dry and next post I will be posting this weeks Summer of Colour Purple challenge. Love all your items, Les. So creative! We have had things around here that have gone similar to yours lately and are so frustrating. I feel for you. We are trying to work through ours also...but sometimes I wonder about how little regard people can have for someone else's plight. Hang in there! ..and where do I start?...I absolutely ADORE the matchbox that you altered for me!! I Love the dress form made out of air dried clay!! (very creative) ..and all the elements you have used Les :) Thank you so much! 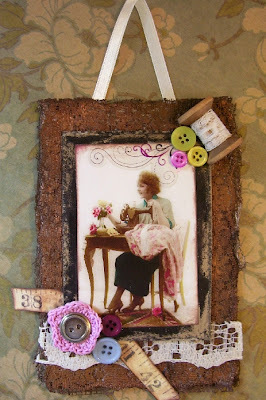 - can't wait to see it in 'real' life now ;) Oh, I do like a sewing theme!! ..and WOW your canvasses are stunning! Loving the images, shabbyness, cute embellies and the texture looks fabulous..the recipients are very lucky. Sorry to hear of your husband's works woes, hope it all sorts itself out soon. Both your canvases are gorgeous - as is the fantastic matchbox - I really can't decide which I like the best!